This entry is for the novel EARTHCORE. EARTHCORE was originally published in 2001 by iPublish, an AOL/Time Warner imprint. With the novel doing well as a promotional ebook, Time Warner was planning on publishing the novel. However, the economic slump following September 11, 2001 terrorist attacks, caused Time Warner to do away with the imprint in 2004. Sigler decided to start podcasting his novel in March 2005, as the worlds first podcast only novel to build hype and garner an audience for his work. Sigler considered it a natural progression to offer the book as a free audio download. In 2006, Sigler was able to get EARTHCORE offered as a paid download on iTunes. 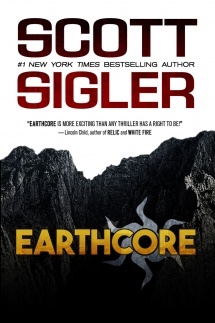 Another milestone was set when EARTHCORE became one of the first audiobooks broadcast on Sirius Satellite Radio, second only to Sigler’s other novel, Ancestor. Deep below a desolate Utah mountain lies the largest platinum deposit ever discovered. A billion-dollar find, it waits for any company that can drill a world's record, three-mile-deep mine shaft. EarthCore is the company with the technology, the resources and the guts to go after the mother lode. Young executive Connell Kirkland is the company's driving force, pushing himself and those around him to uncover the massive treasure. But Kirkland and EarthCore are not the first to find this treasure. The mountain's history reveals two centuries of disappearances, murder, and insanity. The discovery of ancient platinum knives, razor-sharp despite lying untouched for 1,000 years, reveals evidence of an ancient culture. If the artifacts are genuine, they show a pre-historic empire that once spanned from the Southern tip of South America all the way up through the American Southwest. Wealth and fame lie under that Utah mountain, but at three miles below the surface, where the rocks are so hot they burn bare skin, something has been waiting for centuries. Waiting ... and guarding. Kirkland and EarthCore are about to find out first-hand why this treasure has never been unearthed. 1st Ed. Paperback United States November 15, 2005 Amazon.com U.S.
A video trailer was created as part of the release of the German language hardcover edition of EARTHCORE. Released by publishers Otherworld Verlag, the trailer can be viewed at this YouTube link. This page was last modified on 1 April 2018, at 23:54. This page has been accessed 22,106 times.